A first look image from 10×10 (via THR) has been released as the upcoming kidnapping thriller from first-time feature director Suzi Ewing, which stars Luke Evans (Beauty and the Beast) and Kelly Reilly. I previously posted here, the teaser trailer last September and just earlier this month, the full trailer has just been released for Rosamund Pike's upcoming film Hostiles starring Christian Bale and Pike (as Rosalie Quaid, who lost her entire family to a vicious Indian attack). The film opens in limited release on December 22nd, and goes wide January 19, 2018. It is written, produced, and directed by Scott Cooper (Out of Furnace, Crazy Heart). Watch: Kelly Reilly in new trailer for Britannia airing on Sky Atlantic January 2018! According to Digital Spy, Sky Atlantic has released a new trailer ahead of its historical epic Britannia (starring Kelly Reillyas Kerra), which will officially premiere on Thursday, January 18, 2018. Britannia will premiere in the U.K. on Thursday, January 18th, via the 'Sky Atlantic' network. The series will also debut in the U.S. sometime in 2018 through Amazon Prime Video. 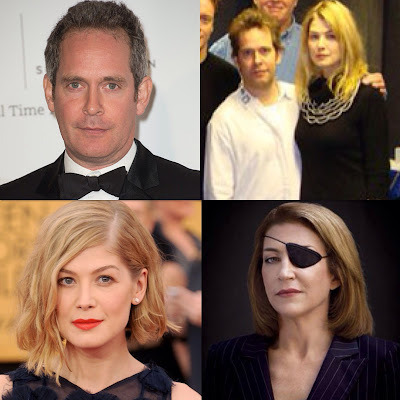 Variety reports that Tom Hollanderhas joined his former Pride & Prejudice co-star Rosamund Pike in her upcoming lead starring biopic film, A Private War. This will be the third feature film (in addition to this movie, they co-starred in P&P and The Libertine with their P&P co-stars Rupert Friend and Kelly Reilly). Also, they co-starred together (along with another P&P co-star Penelope Wilton) in BBC TV Miniseries, Wives And Daughters. I've enjoyed watching them in the same movies even though they played supporting roles in those 2 previous films and the mini-series they both appeared in. Plus, they did a James Bond Radio Special (titled: Moving Finger) as well. Glad Tom is working with Rosamund again! After working with Drive director Nicolas Winding Refn on The Neon Demon, Jena Malone has joined the cast of the director’s upcoming 2018 Amazon series Too Old to Die Young along with John Hawkes, Billy Baldwin, Callie Hernandez (La La Land), Nell Tiger Free (Game of Thrones), Cristina Rodlo (Sony’s Miss Bala), Augusto Aguilera (The Predator) and Babs Olusanmokun (The Defenders), it was announced Tuesday (on Jena's birthday too via Refn's Instagram account). According to PlayBill, Carey Mulliganis set to star and perform a new monologue play (titled Girls & Boys) by Dennis Kelly at London’s Royal Court Theatre beginning February 8, 2018. Today (November 21st), marks the 33rd birthday of Jena Malone (aka Pride & Prejudice 2005's own Lydia Bennet). Jena was born on November 21, 1984 in Lake Tahoe, Nevada, USA. Go see Jena as Sage Ross (as she cameos) in her period gothic thriller Angelica, which is now showing in US Theaters (it opened this past weekend) in limited release! 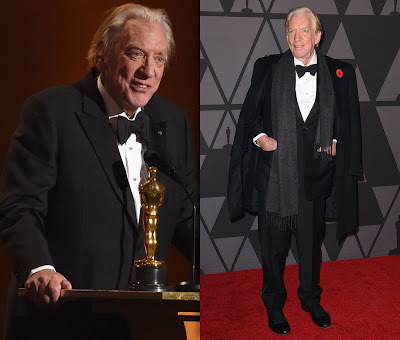 Watch: Donald Sutherland receives Honorary Oscar Award at 2017 Governors Awards! Legendary actor Donald Sutherland(looking dapper and clean-shaven!) attended the Academy of Motion Picture Arts and Sciences' 9th Annual Governors Awards at The Ray Dolby Ballroom at Hollywood & Highland Center last Saturday, November 11, 2017 in Hollywood, California. 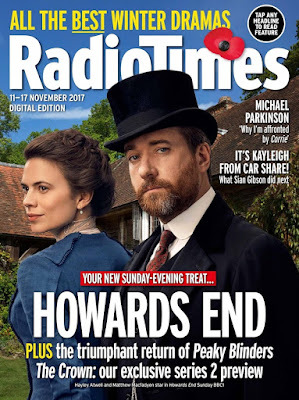 Howards End starring Matthew Macfadyen & Hayley Atwell premieres on BBCOne Sunday November 12th! Matthew Macfadyen and Hayley Atwell's upcoming 4-part Limited Series, Howards Endgets an early premiere in the UK this weekend on BBC One! MM UK fans are lucky they get to see this miniseries much earlier than here in the U.S., which unfortunately (for us, MM U.S. fans), we'll have to wait to see on Starz in the Spring of 2018. It's interesting though, that it's showing in the UK this Sunday, yet there is no official trailer released for it (UPDATE: See Howards End: Trailer - BBC One here! or watch it below). There was only a BBC's Pure Drama Teaser Trailer featuring Howards End here. I guess the teaser was good enough to whet the viewers appetite and no spoilers for UK fans (except for U.S. fans, who will no doubt be seeing clips and images before the Starz premiere), which is always a good thing. Also, Matthew & Hayley (see RT cover image above ^) is on thecover of Radio Times November 17 issue. 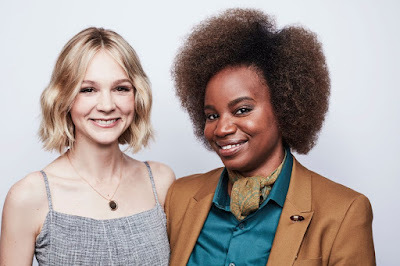 Carey Mulligan is reuniting with Dee Rees, the director of her upcoming Netflix film Mudbound, which is slated to be released to streaming site Netflix and in select theaters next Friday, November 17th! Carey has been cast to play Gloria Steinem in FilmNation's An Uncivil War directed Rees.